The life lesson that I learned from this story is to not make me happy first , for example I should not make me happy first than my mother , I should love her and then make me happy. I would compare the tree with our parents because the give us everything we need and I would compare the boy with us , the children , because we ask to our parents things that we need. The life lesson that I learn from the tree is to appreciate what others give to me,to appreciate every single drop of water I drink and the school i am everything that my parents do is to say thanks, and yes things like this happen in real life there's people that give all for other for example my parents they give all for me they are like the tree that also give all for the boy ,I don't like the boy actitude because he didn't say thanks to the tree for everything that she give to him. WHAT LIFE LESSON DO YOU LEARN FROM THIS STORY? That we must take care of people or things around us. COULD THINGS LIKE THIS HAPPEN IN REAL LIFE? WHO WOULD YOU COMPARE THE TREE WITH? I feel them like my family always aware of me. I learn from this story that I allways have to give all I have to people that I love, like the tree, to be happy. I think this can happen in real life because a person can ask to another for things, and he can give what the person wants. I will compare the tree with real parents, and the boy with real kids, because some in real life kids ask to parents if they can give them something,like the boy, and the parents would give it to them. The tree shows a beautiful value and that value is the generosity.I learn an important lesson: You always have to be thankful with the things that you have and demostrate that you are happy with that things and say thanks for all you give me. This can happen in real life, because there are people that receive presents and they dont aprecciate that things. I can not compare any of this characters but i think that the tree is god and the boy is an angel that is learning how to be thankful with the things. I think we have to put an space in our life to pray and be thankful of god for all the things he give us. The life lesson I learn is that we should be grateful with the people that love us, because they give all the things they have to make us feel happy as the tree do with the boy. I will compare the tree with my family because they give all the things they have to show me that they care and love me, also they give to me everything because they want me to be happy and I will compare the boy with me because sometimes I´m ungreatful with my family because in that moments I don´t to appreciate the effort they make . 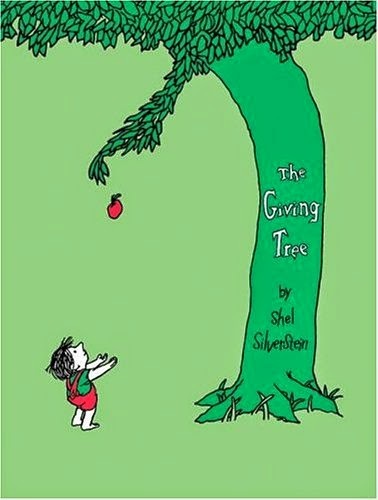 Fom this story I learned that we have to be generous and when we give something to someone we have to be happy of give it such as the tree. Part of the story is like real because there are people like the tree I mean they are generous and they like to give things to the others without thinking in what they are going to give us and there are also people like the boy that only wants to recibe. With my mother because she loves to be generous and when she give something she is happy but when she´s can´t she is sad. My brother because he loves to recibe but not to give . I learn that love will always exist in someone who is faithful with you. I don´t think that things like that happen in real life. I will compare the tree with our parents, and the boy would be us, because when we are little we love to play with our parents, but when we grow we want toys and since we grow up we get far of our parents, but when we need their help they always are there to help us and they will always be for us.The boy can be bad with the tree, but we are like that with our parents. In this story I learned that you don´t have to abuse with someone who realy loves you because that person will give you whatever you ask just to make you happy but when that person gift everything that can give, maybe one day everything will end.. I can compare the tree with God because God will be always there when you need him. But one day he is going to get tired because you only look for him when you need something and is like his patience get over and is like the tree he always help the boy but one day their trunk and branches get over. I can compare a normal human with the boy because many of us have wrong things like the boy. Friendship and generosity. Yes because maybe a person is very generous with his friend. I could compare the tree with a very loyal and genorous person because thats how the tree acted. The boy I could compare him with a selfish person that doesnt give but ask. I learned that you will always have a good friend who will help you whenever you need something. Stuff like this can happen in real life, but not with a tree, trees can't talk. I would compare a tree with your family, and the boy with a son of it, the boy only asks for money and sails, to his home. but the family will always help him and take care of him. I learn that when you love someone without conditions, this person can count with us always. I compare these characters with parents with their children, because the love of the parent is inconditional. I learn that we have to do things by our own and not asking for other people for giving the things. Yes it can happen, for example when all in my are helping and I am watching TV I think I have to help too. I will compare the boy with a person that never do things by his own and the tree with a person that it gaves a lot to the other person and the other person never ask to the other if he or she wants something.